Use toxin-free building materials to combat indoor air pollution, which can be much worse than outdoor pollution. Keep your family-breathing better by installing natural ventilation that use mechanical ventilation systems to filter & bring fresh air in and vent stale air out. Reduce your energy costs by 20-30 percent and reduce your water usage by 40-50%. More durable than most standard homes because of high-quality building materials and better construction methods. 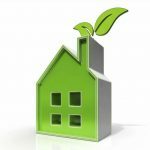 Resale value of a green home is higher than that of a standard home, and the market demand for green homes continues to rise as consumers worry about rising energy costs.